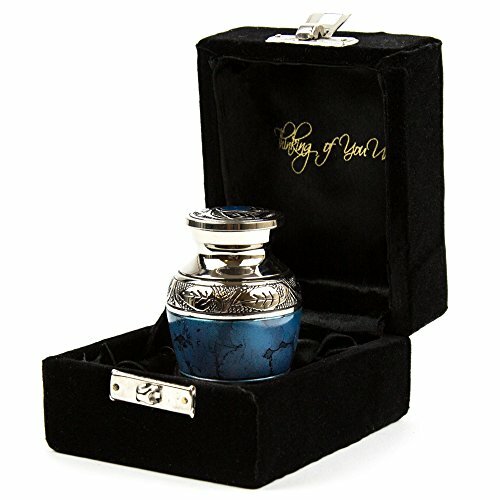 Thinking of You Urns Classic Blue Mini Keepsake Urn. This beautiful blue handcrafted urn is perfect for storing a small amount of human or pet ashes. We GUARANTEE that you will love this high quality urn or you get ALL your money back. This 30 Day Money Back Guarantee only applies when purchased from Somerset Products. Try it now, click the "Add to Cart" button above to give your loved ones the remembrance they deserve ABSOLUTELY RISK FREE! HIGH QUALITY URN: This hand crafted decorative urn makes a great keepsake to remember loved ones. The urn has a protective pad on the bottom to prevent scratching furniture. The interior is also fully coated. SMALL SIZE: The urn is 2-3/4 inches tall and holds about 3-4 cubic inches of remains. This is ideal for storing a small amount of human or pet ashes. It also features a secure threaded screw on lid. AFFORDABLE: Our solid metal urn can be purchased for a fraction of the cost compared to most funeral homes. BEAUTIFUL DISPLAY STORAGE BOX INCLUDED: Perfect for safeguarding and displaying the urn. MONEY BACK GUARANTEE: Enjoy this high quality urn or your money back! We are so confident you will love the urn that we are offering a 30 Day Money Back Guarantee. Try it today risk free! If you have any questions about this product by Thinking of You Urns, contact us by completing and submitting the form below. If you are looking for a specif part number, please include it with your message.